This retro chic Pismo Beach hotel is located on California's Central Coast in the Five Cities area, overlooking the Pacific Ocean. The location is perfectly located in walking distance to all the restaurants and shops in Morro Bay. I love the short walk to the ocean. The room was clean and beds where comfortable. My only moment of concern was the hot tub, it was to small to enjoy. Where to find San Luis Obispo hotels near an airport? How can I find hotels in different San Luis Obispo neighborhoods? Where can I find hotels in San Luis Obispo that are near tourist attractions? Should you be searching for the best lodgings in San Luis Obispo, you have loads of options. Approximately 31 apartments and hotels can be found within a 0.1-kilometre (0.06-mile) radius from San Luis Obispo's city center. Travelers looking for a great place to stay not far from the center of San Luis Obispo, should check out the latest offers at the Granada Hotel & Bistro and Quality Suites Downtown San Luis Obispo. 20 kilometres (12 miles) from the heart of San Luis Obispo is the neighborhood of Morro Bay. This has 29 Expedia-listed hotels. Accommodation options in Morro Bay include the 456 Embarcadero Inn & Suites and Beach Bungalow Inn and Suites. 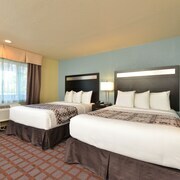 Tourists will also find some good accommodations in Pismo Beach. This hotel neighborhood is 16 kilometres (10 miles) from downtown. The Dolphin Bay Resort And Spa and Sandcastle Inn are some of the 21 hotel establishments in Pismo Beach. You can also find a hotel in Santa Maria, which is where you'll find the Fairfield Inn & Suites by Marriott Santa Maria and Radisson Hotel Santa Maria, or Arroyo Grande, which has the Centaur Health Resort and Spa and Hampton Inn & Suites Arroyo Grande/Pismo Beach Area. Los Osos is 16 kilometres (10 miles) from San Luis Obispo's downtown, while Avila Beach is 13 kilometres (8 miles) from central San Luis Obispo. The Sea Pines and Back Bay Inn are in Los Osos, while Avila La Fonda Hotel and Avila Lighthouse Suites are located in Avila Beach. 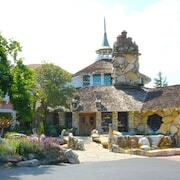 For accommodation that is in the vicinity of the Mission San Luis Obispo de Tolosa, you could investigate the Madonna Inn or the San Luis Creek Lodge. The Madonna Inn is 2 kilometres (1 mile) away and the San Luis Creek Lodge is 2 kilometres (1 mile) away. Students, families and shoe-string travelers can select from some great San Luis Obispo lodging options that definitely won't blow holes in the wallet. 2 kilometres (1 mile) from San Luis Obispo's heart is where you'll find the La Cuesta Inn. The Historic Santa Maria Inn is only 45 kilometres (26 miles) away. Two other options in the budget range of San Luis Obispo include the Motel 6 Pismo Beach - Pacific Ocean and the Oxford Suites Pismo Beach. 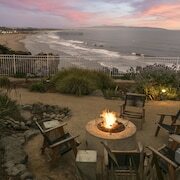 You could try the San Luis Bay Inn and the Pismo Lighthouse Suites. 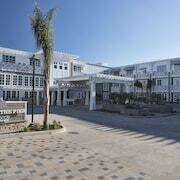 The San Luis Bay Inn is situated 13 kilometres (8 miles) away from the heart of San Luis Obispo. The Pismo Lighthouse Suites, is 15 kilometres (9 miles) away. Other Expedia-listed accommodations are the The Cliffs and the SeaVenture Beach Hotel & Restaurant. Once you have got to know San Luis Obispo, why not tour a little further afield? The Central California region has a number of things to offer. Check out Central California's lighthouses. Lovers of nature could also take the time to to admire the region's valleys. In this section of United States of America visitors may also partake in snowboarding. Looking for more to do? Spend some time exploring Lincourt Vineyards and Mendenhall's Museum of Gasoline Pumps & Petroliana, which you'll find in Santa Ynez Valley, 85 kilometres (54 miles) to the southeast of San Luis Obispo. 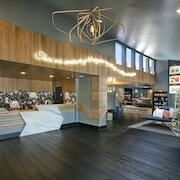 If you'd like to spend a few nights in Santa Ynez Valley, check out the room rates at the Fess Parker Wine Country Inn and Mirabelle Inn and Restaurant. 90 kilometres (54 miles) to the southeast of San Luis Obispo, you may also choose to stay at Solvang, which is home to the The Landsby and Hadsten House. The Hans Christian Andersen Museum and Elverhoj Museum of History and Art are popular sites to experience should you visit Solvang. San Luis Obispo County Regional Airport is a nearby airport for flying into and leaving San Luis Obispo. It is 5 kilometres (3 miles) away. If you would like to stay nearby, try the Courtyard by Marriott San Luis Obispo or Embassy Suites by Hilton San Luis Obispo. What are the most popular San Luis Obispo hotels? Are there hotels in other cities near San Luis Obispo? 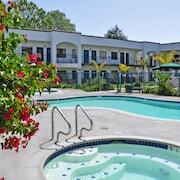 What other types of accommodations are available in San Luis Obispo? Explore San Luis Obispo with Expedia.ca’s Travel Guides to find the best flights, cars, holiday packages and more!